When I was younger, I always looked for more things to do. I always ran out of books to read, places to explore in our neighborhood, and adventures that I could have within our home. Now that I’m 31, I have too much to do. Sometimes I wish I could divide myself into multiple persons so that I could finally get everything I need done. These multiple persons would each have their own mind, but any benefit they gained would be shared by the entire group. One would do nothing but meet with friends and contacts. Old friends, classmates, former neighbors, relatives who live far away… there are just so many great people in life who we don’t have time to catch up with like we used to. This person of mine would do nothing but contact people, hang out with them, and create great memories with them. One would never leave the house and stay all day with my wife and my son. Every hour away from them at work makes me wonder how much I’m missing every day. One would be devoted to just studying – studying huge chucks of Scripture, studying leadership and management, reading thick books that you never want to read again. Another would be investing with people at work. Encouraging, training, bonding, catching up with supervisors, peers, and staff members. This is something I feel like I can never do enough of. Maybe I’d assign two “persons” to just make disciples – connect with people who want to know about Jesus, talk with them, help them meet him, and connect them to a local church where they can thrive. That list could keep going on too… What about you? If you could divide yourself into multiple persons – what would you have them doing? 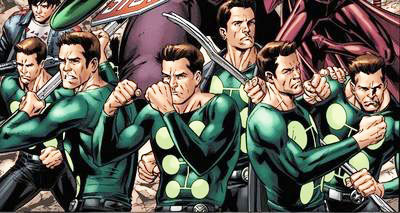 Multiple Man from the X-Men has this power. This is what I sometimes wish for, except Multiple Joe wouldn’t be in spandex. But as nice as it is to imagine this, we all know it’s an impossibility. So while I wish I could do all these things, I take comfort in the fact that I don’t need to do it all. There is enough time in the day to do everything that God has called you to do that day. That statement liberates me because if I don’t accomplish something, I know He will take care of it for me. Tomorrow will be another day. Let’s give today our best shot, then rest at the end of the day knowing that while we can’t do it all, we know Someone who can and who will.